Organic 100% peanuts – crunchy. 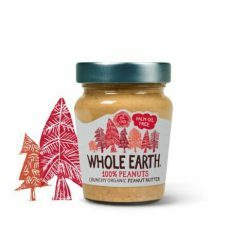 This crunchy, 100% organic peanut butter is delicious spread on bread or toast and as a great ingredient in dips, dressings or sauces. It contains no added sugar, salt nor palm oil. The companyEEs peanut butter is the leading brand in the UK. It is organic, and packed with protein and fibre. It contains no sugar, is made only with organic peanuts, and is available in smooth and crunchy.